Pears belong to the rose family and are closely related to apples. Them are packed with nutrients, fiber and antioxidants, making them a delicious and healthful snacking choice. Since they are hypo-allergenic, pears are often recommended as a safe fruit to introduce to infants, even individuals with food intolerances can eat pears without any risk of side effects. Here are 7 health benefits of pears that may make you want to eat them more often. You can use pears for weight loss. 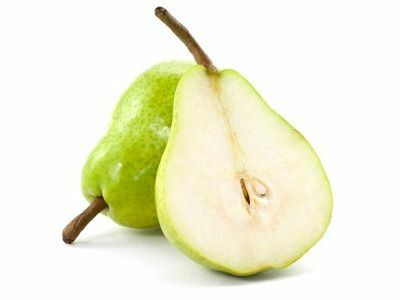 Pear is one of the very low calorie fruits, provides 58 calories per 100g. In addition, pears is one of the highest fiber fruits, 100 g fruit provides 3.1 g or 8% of fiber per 100g, they keep you feeling full for a longer period of time. Most constipations is simply the result of consuming too little fiber, and adding more fiber to your diet is the simple remedy. As mentioned above, pears is one of the highest fiber fruits, it can prevent a bloated belly caused by constipation, and the pectin in pears is diuretic and have a mild laxative effect. One way to prevent cancer is by eating fresh fruits and vegetables that are high in antioxidants. Pears contain vitamin C, a powerful antioxidant which act as good anti-oxidants that protect cells from damages by free radicals. Studies have also shown that eating fiber-rich fruits such as pears can reduce risk of breast cancer by 34 percent in post-menopausal women. Pears are safe to eat during pregnancy. In order to avoid birth defects, it is important for a pregnant women to consume enough folic acid. Pears provide approximately 12 micrograms of folic acid per piece of fruit, according to the Pear Bureau Northwest. Although that may not seem like much, when it comes to folic acid, you should get as much as you can during pregnancy. The recommended daily intake of folate for pregnant women is 600 micrograms. Pears with honey are a simple and effective home remedy for coughs and sore throat. If you already have a sore throat, warm up the pear juice together with the honey and drink up to relieve yourself from aching throats and other inflammation on your throat and tonsils. Please note: Infants under 12 months of age should not be given honey under any circumstances. Sweet cravings can lead to an imbalance in blood sugar levels in people with diabetes. If you include people with diabetes, there’s no reason for you to not like a pear. Pears make a smart snack for those with diabetes. The bloodstream slowly absorbs a pear’s carbs (just about 26 grams per pear), preventing a spike in blood sugar and helping to control blood glucose levels. Studies of Harvard University says that eating a pear in large amounts can lead us away from type 2 diabetes. Preventing and treating osteoporosis is a major concern for many people. Pears contain high level of boron, which researchers believe may help the body to retain calcium, thus prevents or retards osteoporosis.